In the flurry of posting and mailing teams from last week's Spring Training giveaway, I left one for last: the Minnesota Twins. A lot of fans with a soft spot for the Twins hearken back to when two worst-to-first teams faced off in the 1991 World Series, Minnesota and Atlanta. Several high points stand out, especially for fans of Kirby Puckett and Jack Morris. One of my favorite bits: game three went so late and swapped so many players (12 innings) that we almost saw an outfielder pitch in the World Series. Here's the late-innings summary from Wikipedia. "At this point, the game got bizarre. Substitutions and double switches were used by both teams into the twelfth, when Minnesota manager Tom Kelly used up his entire bench and had to send reliever Aguilera to pinch-hit for the active pitcher, Mark Guthrie, who had never had an at bat in his major league career, with the bases loaded and two out (Aguilera flied to center and the ball was caught by center fielder Ron Gant). Kelly said in an interview that if the game had gone on longer, since he had used up all his relief pitchers, he would have put left fielder Dan Gladden on the mound and put Aguilera in the outfield." WHAT YOU WIN: I've got about 30 Twins cards to pass along, including all three stars shown in this post. WHAT TO DO: Add a comment with a fan memory related to the Twins, for good or ill. It can be one their World Series appearances, the time you met Kent Hrbek, or deep fly balls bouncing off "the baggie" in the Metrodome. I'll pick a random winner from all entrants! I have a 1987 Cardinals World Champions Pennant, that'd been the centerpiece of my displayed collection of memorabilia ever since I realized the Cardinals actually lost that year (I was 5 in 87, not quite aware of what was going on). I guess in those days they didn't control the merchandise as well. So on some level I'm glad the Twins won, as it makes my pennant rather unique. let's not forget how blatantly Kent Hrbek cheated during that very same series. When I interned at the Hall of Fame, there was a fellow there who was a diehard Twins fan. 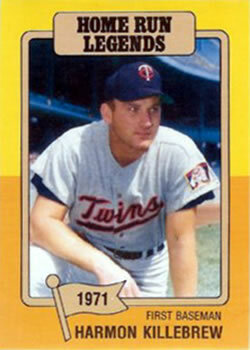 He was in the summer after his junior year of college and had been an usher for the Twins for years. The Twins apparently give their ushers white sneakers with the Twins logo on the side. The Hall didn't have usher shoes in their collection and they asked him if he'd donate his shoes at the end of his internship which he did. Also, the first ballgame I ever scored using the Project Scoresheet methodology was a 1987 Twins World Series game which caused my interest in baseball to explode a gazillionfold. One of those things where I wonder how my life would have turned out had I not done it. One of the very first TTM's was from a Twins rookie named Rene Tosoni. He put my name and his jersey number on all three cards I sent him. Anyways, he is one of my favorite players now just because he did that for me. Wow, looks like Captain Canuck's favorite Kent Hrbek / Ron Gant play from game 2 made it onto a bobble head. 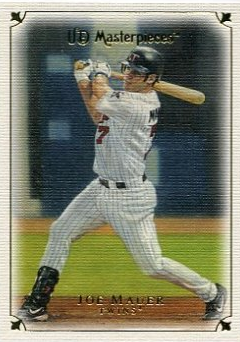 Hrbek's "move" (shove?) became known as the T-Rex Tag, when Kent joked he'd switch to wrestling under the name T-Rex after baseball. I grew up in Milwaukee in the 1970's and 80's, and have forever been a dyed-in-the-wool Brewers fan. Every summer, my family would travel "up-north" to central Wisconsin where we would spend a week camping. One of the annual highlights was to attend at least one Wisconsin Rapids Twins game. (The Twins were a single-A minor league franchise affiliate of the Minnesota Twins.) We loved the small-town feel of the games, (they gave fans a dollar coupon toward concessions for returning foul balls) and had free access to the players. The program was also were the place to collect autographs. Even though the careers of these players rarely went anywhere, the autographs were a big deal to a little kid, so I saved them with my other baseball treasures. Fast forward 10 years; I was cleaning out a bunch of my old junk from my childhood home, when I stumbled across my old WR Twins programs. Expecting only a nostalgic trip down memory lane, I was delighted to discover that among the 8 or so autographs on the cover of my 1980 issue were what were clearly the names Gary Gaetti and Kent Hrbek! These future all-stars and WS Champions were just 20 years old when they signed them. Today, I live in Eau Claire, WI (located 1 hour east of Minnesota's Twin Cities). My wife grew up here and has been a lifelong Twins fan, and my 7 and 10-year-old sons, being young diplomats,root for the Brewers and the Twins. We regularly attend local minor-league games, played in Eau Claire's historic Carson Park, where we collect autographs and enter on-field contests. (We do get to keep any foul balls). This was the home field for Bob Uecker, Joe Torre, and Henry Aaron all played with the Eau Claire Bears at this park on their way up to the majors in the 1950's and early 60's. More recently, we watched Jordan Zimmerman, currently with the Washington Nationals, pitch for the Eau Claire Express. Baseball is timeless, exerting the same pull on fans generation after generation. I love this game! PS: Eau Claire has several Taco Johns franchises, and their current ad campaign for the new fish tacos features none other than Kent Hrbek as spokesperson. Things have really come full circle.